Hatsune Miku and Sega seem like a match made in heaven for those in Japan. The insanely popular PS Vita game Hatsune Miku Project Diva f turned out to be the system’s ‘killer app‘ and is now moving over to the PS3. 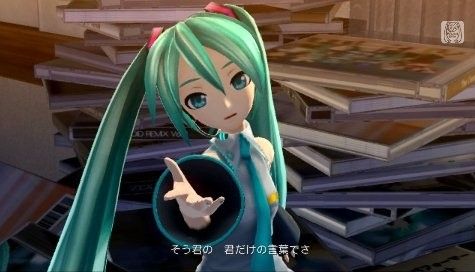 Hatsune Miku Project Diva F (take note of the upper case ‘f’) is due for release in Japan Spring 2013 for the PS3, according to Famitsu. Essentially a port of the PS Vita original, Hatsune Miku Project Diva F will omit the Vita ‘scratch’ icons and camera-dependant AR mode. In their place with be new modes and a new ‘star’ icon, although details of both of these features have yet to be announced. System and edit data from the PS Vita version will be transferable to the PS3 version. Anyone going to import the PS3 version? Is the PS Vita version enough for anyone? Let us know in the comments below! I am importing both the PS3 and PSP versions together. Can’t have enough Miku! What I want to know real badly is, will the PS3 version be released in a Limited Edition or will just be sold as a standard game alone?